George Washington: A Biography in Social Dance by Kate Van Winkle Keller and Charles Cyril Hendrickson. Six minuets, six cotillions, forty-nine country dances, three- and four-hand reels, jigs for one or two dancers, and a fancy dance (The Brandywine, Independence Cotillion, Congress Minuet, Hessian Camp, Washington's Resignation, The New Constitution, Mount Vernon, Washington's Reel, The President, The Free Masons, Lady Washington's Reel, Saw You My Hero George, Washington's handwritten "Rules of Civility"). Directions for each dance have historically accurate figures, suggested steps, and music with chords. Detailed instructions for 18th-century dance technique, figures, and steps. 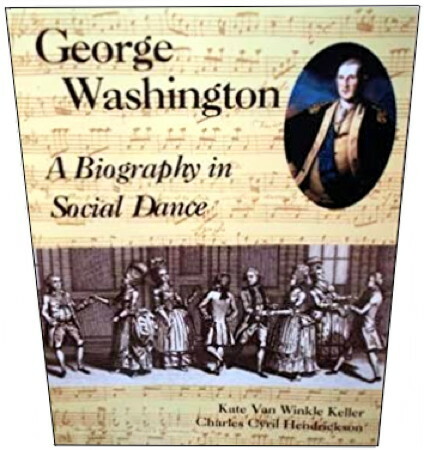 A complete manual for dancing the minuet, music for Pompey Ran Away and Negroe Jig, the steps for Durang's Hornpipe, and Washington's description of an Iroquois dance. Song lyrics included for several tunes. Old Time Ballroom Dances that are Fun to Dance Today, a book. Hillgrove's Ball Room Guide and Practical Dancer, a book.